Basically our blower units will heat any gas cylinder, compressor tank, or 350mm pipe, or Marshal heater, firebox, boiler, and do it cleanly. Also any size cylinder, as you see in the video's from 9 kg cylinders to 45 kg cylinders using the same blower unit in all. So if you have a cylinder lying around your home then really, you have the ability to make free heating for your home, or pool etc. All you need to do is drill a 2" hole & fit it to the cylinder either with bolts or weld. Cut a flue outlet and a door, and there you go, free heating. Put a copper coil inside it, connect up the water, free hotwater it's not rocket science. The savings are huge, think no more heating or water heating bills add that up. These blower units are about the same price as a cord of wood. You'll never have to pick up another piece of wood up in your life again. These heaters operate like a gas heater light it, turn off. Using a timer for the oil delivery, light it, and pretty much forget it, until you turn it off. So free heating is available it's just up to you. A customers feedback after we built him a custom blower burner unit, to fit an existing water heater, which was running with a expensive diesel burner unit, costing alot in diesel. Aaaaaaah the warmth. It's been running for a few days now and is excellent…less noise, less smoke, more efficient, more consistent output. Very good Hamish 10/10. Hello Hamish, We're just had another look at your website and had a good laugh. Seeing our 'twisted' blower unit. Now some of the fact aren't quite correct, after 5 months of constant use, often with 8 radiators and two showers going simultaneously we had to say it's fantastic 20/10. After 40 years burning wood and sometimes coal on various water heaters in different houses this is it. View of the fan housing eletronic fan speed controller fitted inside the box. The new blue blower burner units with our details, nicer more professional looking product. Fan Box, fan, Speed Controller, heat guard, 12 volt, 240 volt power adapter. The hole in the plate is 51mm. Filter all your oil even if it's just through a kitchen sive. These blower burner unit at designed to be fitted to a chippy heat, log fire or 45 kg Gas cylinder. Showing it entering the pot. To get your waste oil heater running cleanly, you will notice the flame in the video above is white, yellow in colour and very agitated with pointed tips on the ends of the flame, if you are getting a dark orange / black flame then it will smoke, so by increasing fan speed or replacing the fan for a better CFPM fan, and reducing the oil flow you should get a cleaner burn. Our fans look like a cooling computer fan but i assure you they aren't. The waste oil burner blower unit in action above video. When it comes to lighting these blower units, filter all your oil before burning starts using a large orange Mitre 10 funnel $9.90 and a kitchen sive $3.00 with handle removed place the sive inside the funnel pour your unfiltered oil through the sive and into your 20 litre plastic storage tank. Put not one, but two lengths of flues 1200mm x 150mm onto your heater, this gives it draw. To light your heater pop a small rag inside the pot, and start the oil flow so you have a teaspoon of oil on the rag then turn the oil off. Light the rag & oil with a gas torch, turn on the fan and when the flame catches.Turn the oil on, if using a needle valve only to about 3-4 drips a second until it heats up, then increase the oil flow as require, but just to a thin steam just past a drip, not past 2 turns on the needle vavle, if using a dual timer 1 second of oil 5-6-7 seconds delay. Decrease the delay for hotter increase the delay time for lower heat levels. If your heater smokes you are feeding it too much oil, or you haven't got enough flame in the pot, moving the pot can help or turn the oil flow off until the smoke clears, then turn oil flow at a decreased rate. 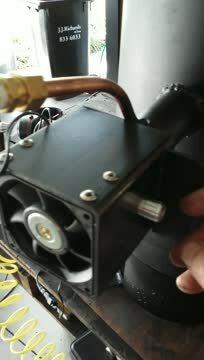 Turning the fan speed up will also help clear smoke levels.